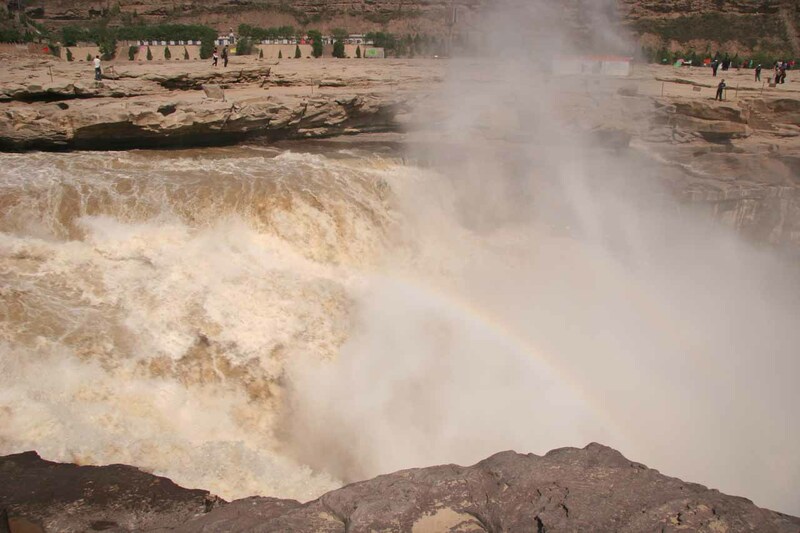 The Hukou Waterfall (壶口瀑布 [Hǔkǒu Pùbù]; Teapot Waterfall or Tea Kettle Spout Waterfall) was one of those waterfalls that had volume and power instead of a tall drop. 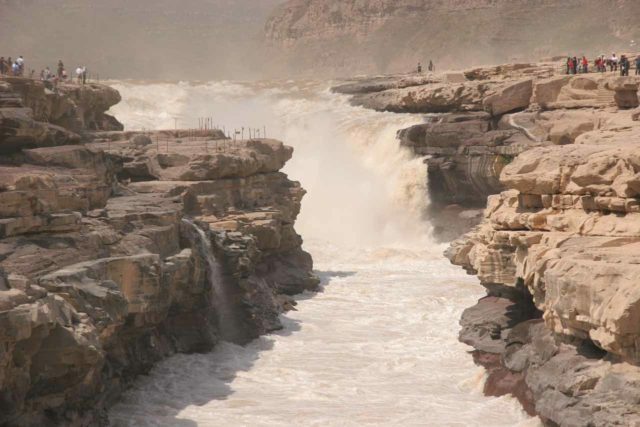 This waterfall also struck us as unusual because of its yellowish appearance, which resulted from its presence directly on the Yellow River (黄河 [Huǎng Hé]), China‘s second longest river. And in settings that were mostly arid desert lands that were very reminiscent of the Colorado River in the American Southwest, having the river meader through such seemingly harsh climates made this waterfall all the more memorable (not to mention the amount of work it took to get here in the first place). 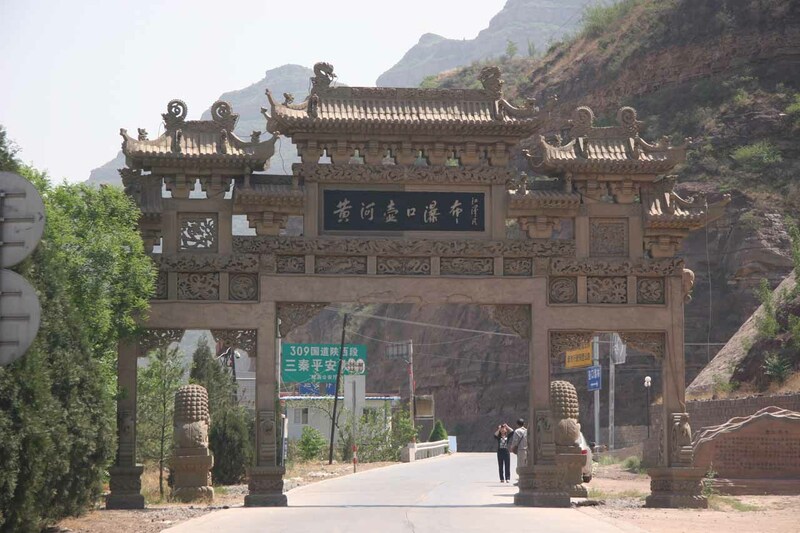 The falls was actually shared between both the Shaanxi [陕西; Shǎnxī] Province as well as the Shanxi [山西; Shānxī; “Mountain West”] Province since the Yellow River defines their shared mutual border. The Shaanxi Province was most notable because it was the province that was the home to the famous Terracota Soldiers [兵马俑; Bīng mǎ yóng] in Xi’an [西安; Xī’ān]). 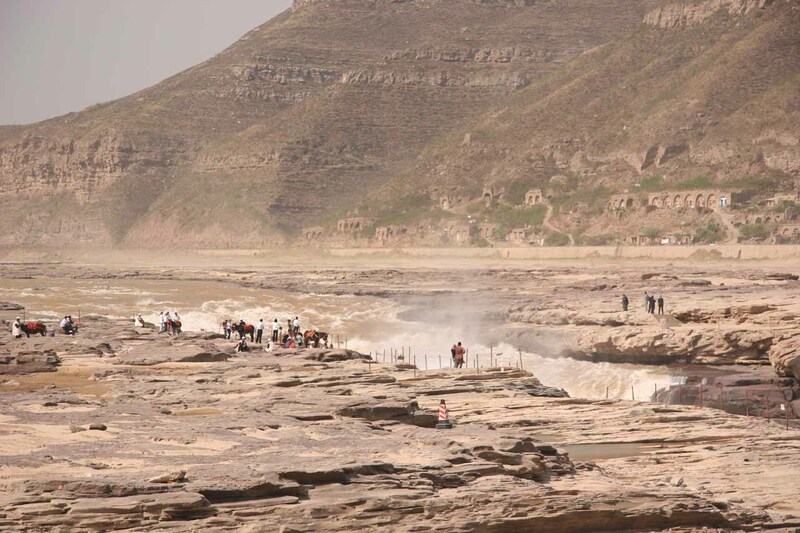 We thought it was definitely worth checking out the falls on both sides of the river for the full experience. 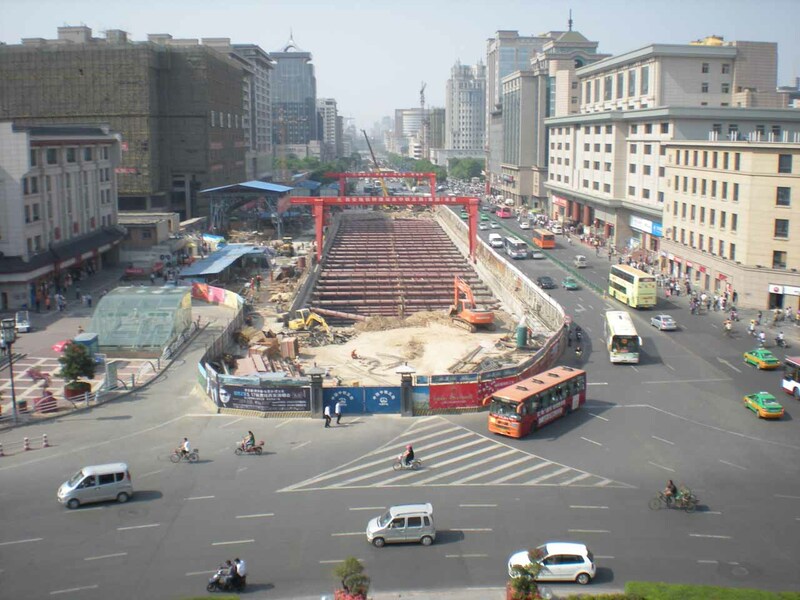 Unfortunately for us, we were only able to see the falls from the Shaanxi side because the bridge to the other side was under construction. We were also running too short on time to make the long detour we would’ve had to take to overcome lack of the nearest traverse. 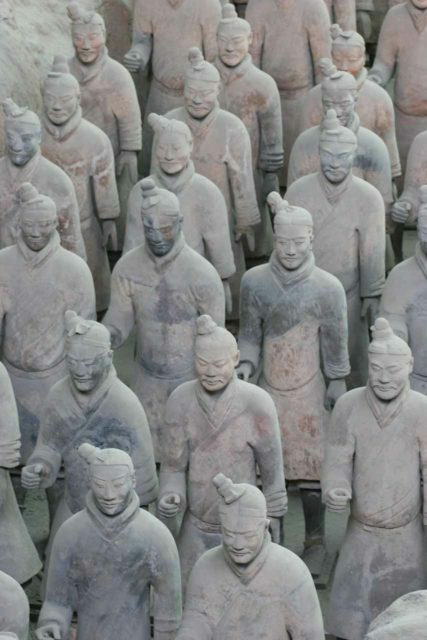 So we really can’t say anything from personal experience regarding the Shanxi side. 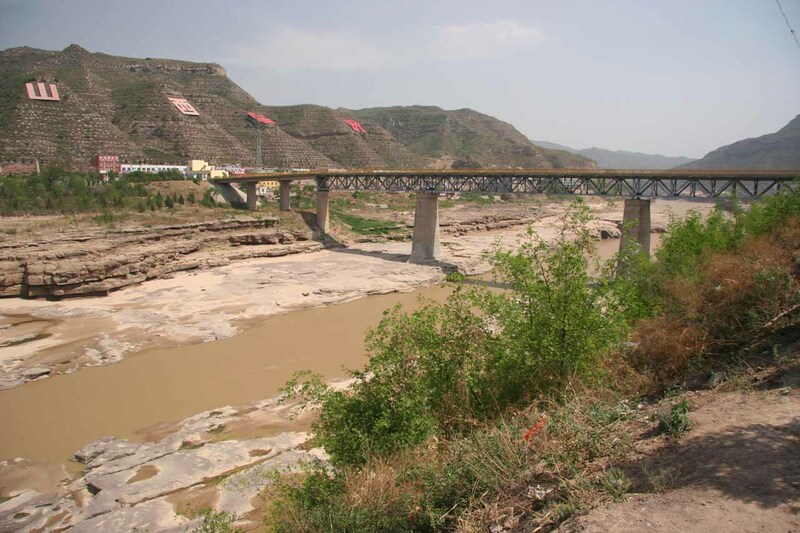 But from looking at the overlooks across the river and imagining what the view would be like, the Shanxi side looked to have more frontal views of the falls. 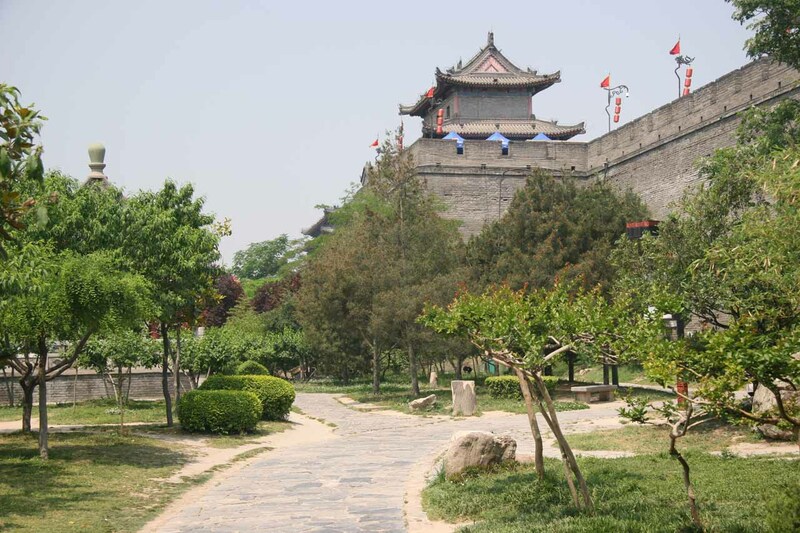 There was even a path that led down steps (possibly through either a tunnel or narrow passageway) to a lower viewpoint looking almost face up with the falls. 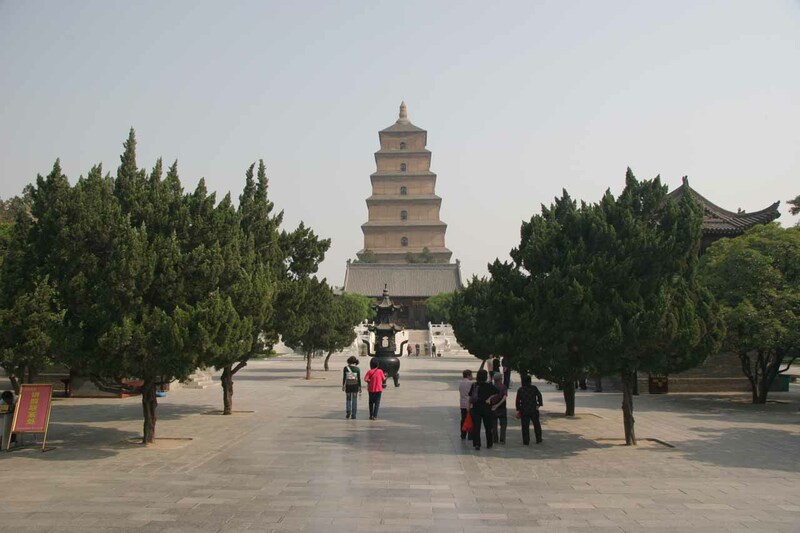 The Shaanxi side (which was all we got to experience) had more top down and comprehensive views. 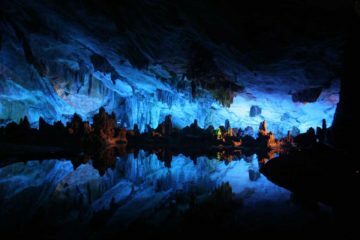 In January 2009, unprecedented ice flows occurred on the Yellow River that caused the closure of this attraction until early April. We were lucky to see the falls a month after it re-opened, but we could still see that most of the lower viewpoints remained closed. And that was probably the main reason why we couldn’t take the nearest bridge across to the other side because the ice flow might have damaged it. 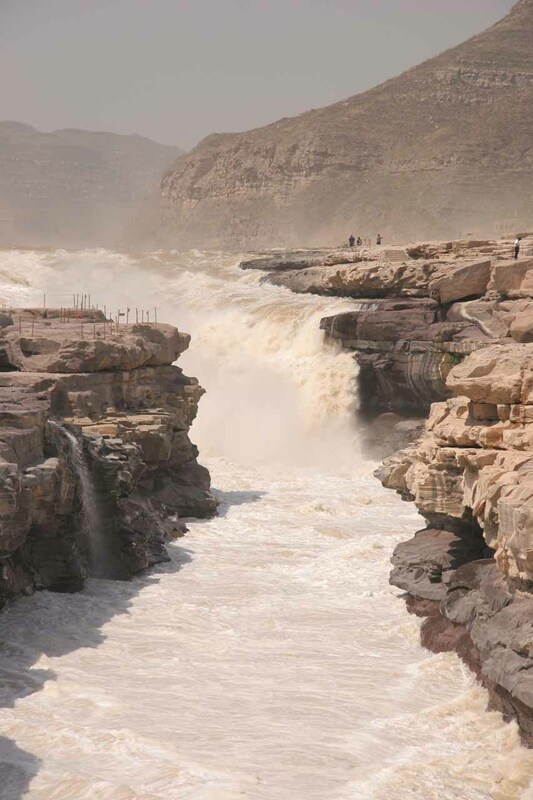 The “teapot” or “tea kettle” metaphor was said to come from the turbulence and pressure caused by the constriction of the Yellow River getting squeezed into a narrow gorge at the Hukou Waterfall. Apparently, this turbulence reminded someone of the turbulence of boiling hot water in the process of boiling and brewing tea. 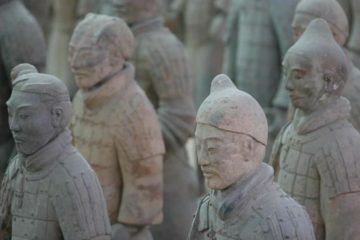 The pent up pressure and steam would ultimately result in the whistling tea kettle that we would be familiar with when the water within was brought to a boil. 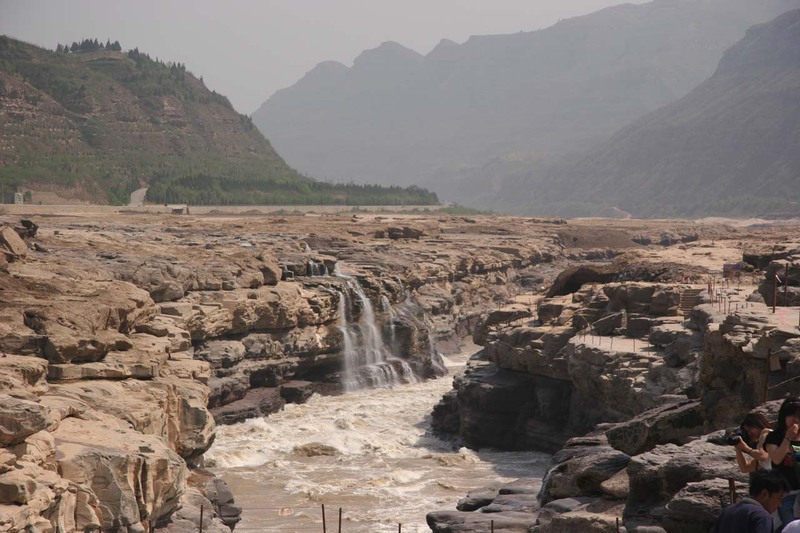 I’m betting that the falls would be at its highest flow when the floods would arrive during the Summer rains combined with melting snow from the Yellow River’s origins on the Tibetan Plateau. 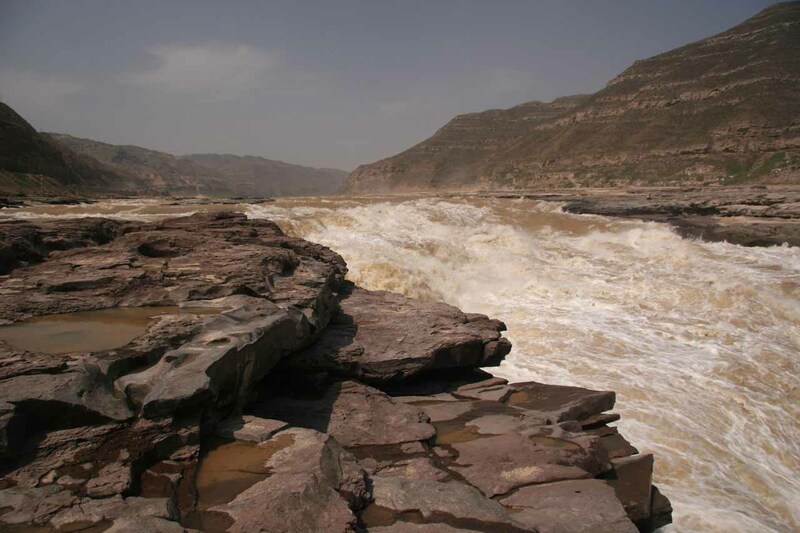 Our visit coincided with a time when the Yellow River might have been at its lowest flows for the year, which you might be able to tell from the photos on this page when compared to other photos out in the literature. For all intents and purposes, we considered this to be pretty much a roadside waterfall even though we did have to make a brief walk to get right up to the edge of the river’s bank next to the falls. It was that walk that compelled me to bump up the difficulty rating by 0.5. 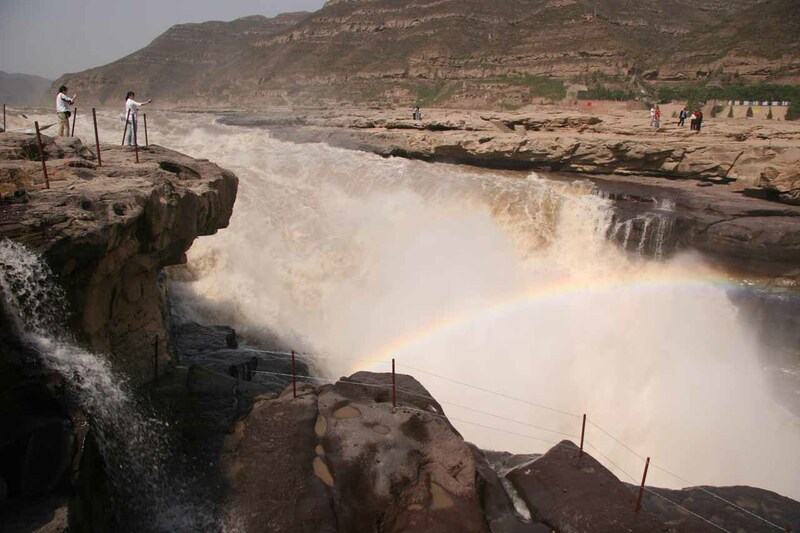 As for getting to Hukou Waterfall, even though it’s possible to make a long day trip out of Xi’an, it’s actually a bit of a stretch as you’re looking at over 5-6 hours of driving in each direction (traffic notwithstanding; trust us on this one!). 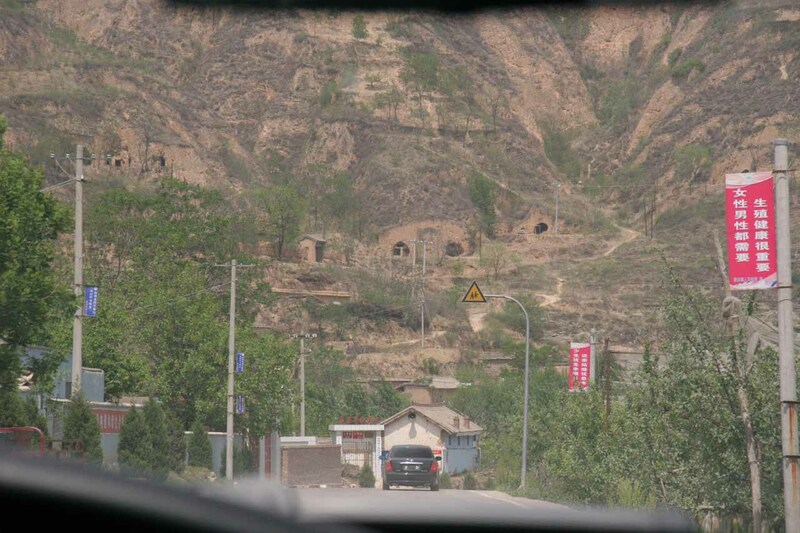 To keep us occupied during the long drive, we did notice quite a few of what appeared to be cave dwellings en route. 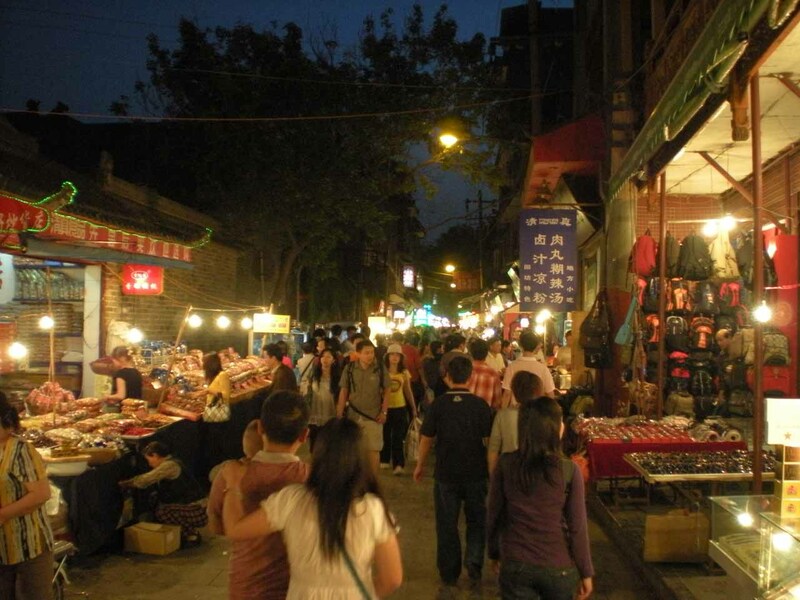 Perhaps a more reasonable option would be to base yourself for a night at a town closer to the falls or at one of the nearby hotels we saw on the Shanxi side (note: Taiyuan, Shanxi’s capital, looks like it’s also some 300km away). 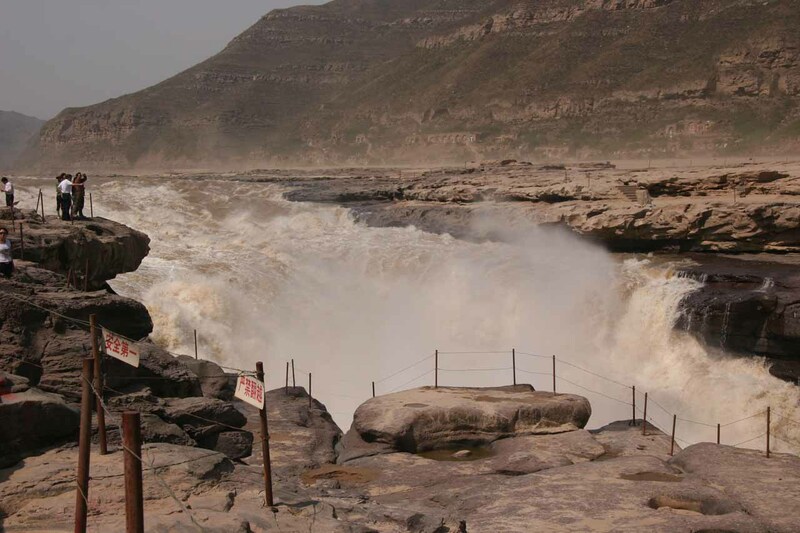 So either way, this waterfall is quite remote and requires a bit of effort to access. 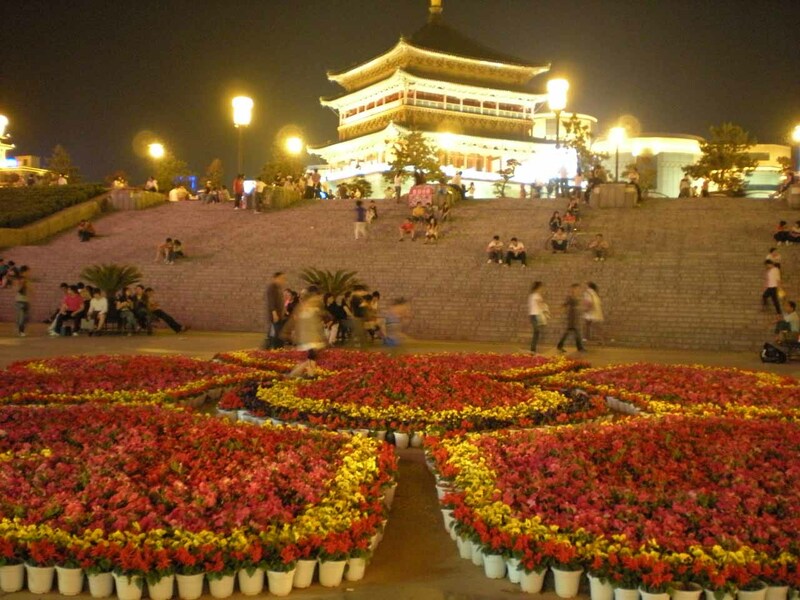 From a geographical context, we took a 90-minute flight to Xi’an from Chengdu (742km or nearly 9 hours drive). 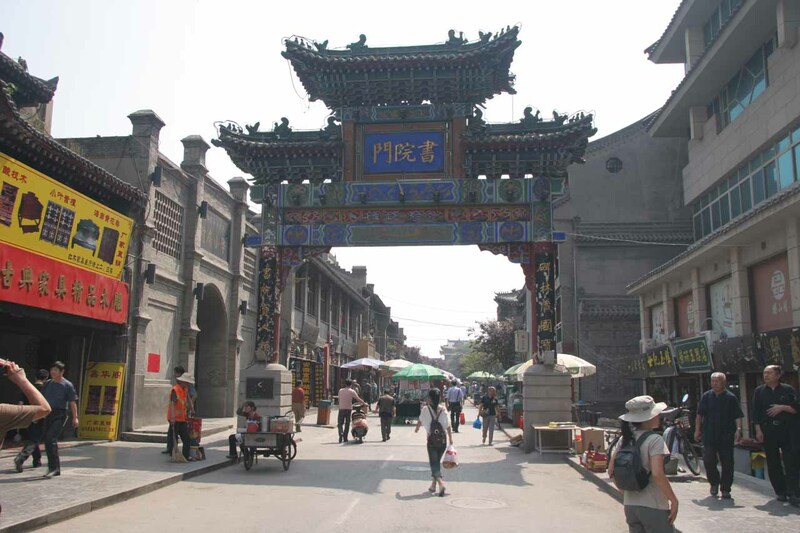 Xi’an was also 1,377km (14 hours drive or 2.5 hours flight) from Shanghai as well as 1,074km (over 11 hours drive or 2 hours flight) from Beijing.